Continuing the theme of watercolour washes - I finally managed to achieve a lighter effect! 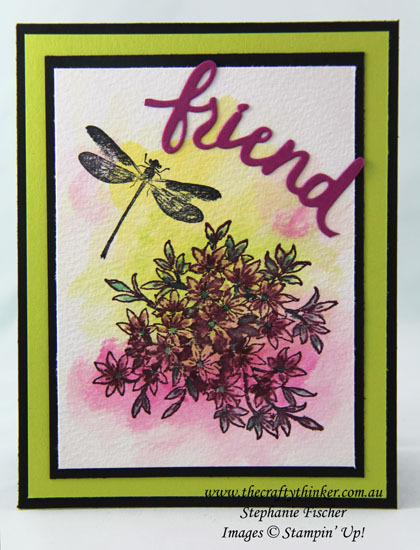 The colours I used for the background were Daffodil Delight, Lemon Lime Twist and Berry Burst. Once it was dry, I stamped the images from Awesomely Artistic in Basic Black ink. I, very roughly, added a bit more colour to the foliage with Fresh Fig and Tranquil Tide inks. The base card is Basic Black followed by a layer of Lemon Lime Twist, another of Basic Black followed by the Watercolour Paper. As a last step, I added the die cut word "friend" in Berry Burst. To obtain this die cut, I used one of the new Lovely Words thinlits and simply snipped the word from the middle.